I wonder if people are still sneaking out at night to their refrigerator just to spend some alone time with their favorite food. I hope I'm not the only one that still do those things. Kekeke!! 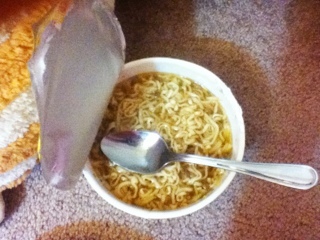 Yep, I made myself some noodles. Although beef is my number one favorite food of all time. BWUHAHA! I'm beast like that, I snuck out at 1 AM just to cook this (meh was just so hungry). Hehe FADOODLES...I should start using that :P Bleh!